We were invited to participate in a juried art show held in the Washington County Courthouse. This photo was published in the Observer-Reporter newspaper on May 9, 2004. 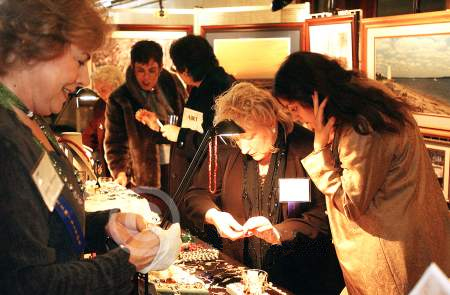 Carolyn Thornton, left, of Rainbow Gems polishes her jewelry as she gets ready to help Margie Mallery Seamon and her niece, Stephanie Csonka, right of Freedom, Pa., during the Art in the Round Saturday, February 29, 2004, at the Washington County Courthouse.